Your eyelids are frozen shut, your feet have lost all feeling, and your fingers are turning black from frostbite. That must mean it's time for another Light Grey Game Night! That's right, mark your calendar for Wednesday, December 17th from 6:30 to 9:30 PM! As you might remember, we're attaching a theme to each night to help people narrow down what games they might want to bring (although you're still welcome to bring whatever you'd like!). This week's theme is Stay Frosty! 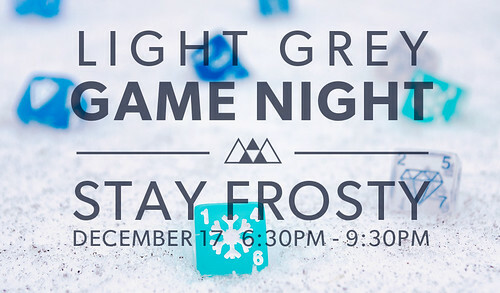 We'll be playing games that take place in the frigid frozen tundra. We'll be rolling to avoid frostbite (and zombie bites) in Dead of Winter, and hoarding supplies to survive in Arctic Scavengers. Or maybe you'd like to crush those annoying Tundra Orcs in Summoner Wars, make a frigid team with Iceman and Emma Frost in Marvel Dice Masters, or break layer after layer of 'Ice' in Android: Netrunner, among plenty of others! If you have a favorite boardgame, bring it!